Not Too Late To Help Tammaye Save The Tatas! Tammaye and her tatas say "Thank You!" Halloween Drink Suggestions, to be featured on Island Time Radio later tonight. Tune in to wbwc.com between 11:00 and 11:30 EST to listen! Shake all ingredients and strain into a large shot glass. Sprinkle cinnamon on top. Prepare as a regular pumpkin pie shooter, combining the first three ingredients in a shaker and straining into a shot glass. With cinnamon-sugar at the ready, top with 151 and light. As the rum is burning toss cinnamon-sugar in, creating fun fire effects. This is a visual shot. Pour the peach schnapps into a shot glass. Slowly pour the irish cream over the schnapps. DO NOT LAYER. Allow the irish cream to sink into the schnapps. It will clump together quite nastily. Drop in a few drops of grenadine from a bar spoon. Combine all ingredients in a highball glass. Stir and garnish with a cherry. Combine all ingredients over ice, balancing with cranberry juice. Stir and serve. Pour over ice in a rocks glass and stir. Enjoy! Combine all ingredients over ice, topping with a splash of Sprite® to make it bubbly. Note: The original recipe is very complex. Here is a cheater recipe that you can make in bulk. Combine all but the 151 in a tall glass and stir. Top with the 151 and garnish with a cherry. "My favorite of all of my Pango originals, this was actually an accident. My original idea was a blud drink to be called Blue Heaven. After I dropped some grenadine in my mistake, the Voodoo Koolaid was born." Pour all but grenadine into an ice-filled Collins glass (or pint glass), using equal parts of both juices. Slowly stir in the grenadine. Enjoy! Mix together everything in a punch bowl. Add a bottle of vodka for an alcoholic punch. Just a random post with the many ways to communicate with me. Tune in to Club 927 right now! Listen to Club 927 on Beach 92.7 FM at 9pm to hear the Transfers. You might even get treated to my voice. The Transfers are also featured at www.udiscoverme.com! Listen worldwide (or listen to the archives starting tomorrow) at www.beach927.com. U Discover Me is a venture that I am part of, showcasing regional bands. Message me for more information! By suggestion, I opened media monkey and hit random. These are the first 25 songs that played. My laptop doesn’t have much music on it but here ya go! Pretty Good Stuff! David Lane, Legacy, & Scholar’s Word are regional musicians and friends. Who should click them and check them out! My favorite Facebook comment of the day! Yeah, I'm not nearly as angry as I was back then. By the way, David House called me yesterday (1st time in like 10 years) and said that they found a letter from you that was stuffed in the control room wall dated December '95. It said something witty and then told the person that found it to contact you, so David was calling me trying to find you. Your spirit lives in Juvie!! A great post by my Kathleen Nieves, a colleague in San Francisco. As I have always said, making drinks is the easiest part of being a bartender. Combine ingredients with ice in a cocktail shaker. Shake and strain into a chilled cocktail glass. Garnish with a thin disk of lime floating on top. Thanks to everyone for the good vibes! Wow! I didn't realize the negative feedback an article about a local guy happy in what he does and those he serves would generate. Thank you to everyone who has given me waves, handshakes, congrats, high fives, etc in response to yesterdays Daytona News Journal piece. In addition to face-to-face aloha, customers and friends have given me virtual kudos. Here are some of my favorites, many which I have no idea who posted them. "Just got back from the Golden Lion. Gave tikitender a copy of the article. It is so cool to have such a nice guy as a local celeb." "Ur the best Tiki!!! U were too busy for me to say bye tonight...we will back this week as we ride for biketoberfest!!" "Hey Mark I just wanted to say congratulations on the News Journal article, very cool! You deserve it!" "Tiki, my friend, I'm so excited for you!!! I think this article is fantastic just like you!" "Lad I don't know where ya been, but i see ya won first prize!" "Wow! I know a star! and we've never met"
"Had to go to 3 convenience stores to get a paper. First two were sold out." "wow, way to go mark!" "I was so proud of Mark when I read that today.He is really a nice guy.And great bartender.Congrats to Mark.And the Golden Lion"
"We have known Mark for 13 years, he is one of the good guys." "what a breath of fresh air to hear and read about !! ...someone who is indeed loving his life and job and appreciates them both...........now there is a Nobel Peace Prize in the making." "Mark is a great guy! I was happy to see this article about him." "I saw the headline and knew exactly [who] they were talking about!!! Mark is a fantastic bartender and such an asset to our community. He not only can make a great drink, but he also does quite a bit for the community, working in various charities and I love reading his Facebook when he goes to read the Bingo balls for the seniors. We are lucky to have him in Flagler County." "I read about my favorite bartender in today's newspaper. Good for you!!" "good comments on your Daytona Beach News Journal story on the Palm Coast Facebook page: http://bit.ly/hM7iO ....you're loved!" "LOVE seeing others who LOVE what they do for a living. It's refreshing, ya know?! Keep up the good work." "Awesome article! You rock. . . All that excitement! I need a nap." "I love the article NJ did on you. Put your hater blockers on, man. You make me smile everyday." "what a great story about one of my favorite people. written by another favorite person!!" "When I need a bartender, I know just where to go...the famous @tikitender"
"Great story! More people should follow their dreams and forget the craziness." "So nice to see someone who loves their job. As long as you love your job, you will never work a day in your life. I'm jealous! LOL! Thanks for the story NJ, it breaks up the doom and gloom!" "I love tiki!! I have a drink named after me and he is an amazing guy! Glad I finally got to see an article on him. one of his many!" "Great article on a great asset to Flagler Beach." "tiki is the man and his wife is awesome too. once you know mark you know him for life and will never forget your drink. good job mark. keep it up." "Mark, i think you are awesome! you work where others come to play, and everytime we come to the Lion, you have a smile on your face!!! " "Tiki is the "Purveyor of good times" to the Flagler locals and is a great guy! People will always knock the people that are happy when they are are miserable. I'm glad that you have the courage to have a happy life Tikiman! Thanks NJ, I am sick and tired of the misery that is the news! Keep the happy stories coming for us happy people!!" "When you have a member of the team that loves what he does...you have something. Mark seems to be someone who is pushing the business. Mark's brand of enthusiasm brings a sense of pride to the other members of the team. When you get a few people liking what they do anything is possible." "Mark is a great baartender and he DOES love his job! Its nice to see someone love their job and also be so good at it! Keep up the good work TIKI. :o)"
"I loved the story! There should be more stories like this! We need more focus on every day people instead of the political men and women who have corrupted our nation! Huge KUDOS to the NJ! Keep up the good work Mark...0-69!!!! BINGO!" "Woods is a East Coast Flagler Beach A1A Icon and treasure. I'd say his social presence is a tiny economic jumpstarter for the area. Do you know a lot of hotels that area are running full? It's treasures like these that make a place a great place to visit. Tiki is also a master at concocting what I call vintage drinks. While many items like the Rum Runner and Planter's Punch have been Cruise shipped and Applebee'd into miserable phantoms of their previous selves, bartenders like Tiki not only continue to make them right, know their history...but have the skills to create all new concoctions..often on the fly. Mark is one of the things that makes Flagler BRILLIANT fun and one of a kind. He keeps the heart of real Florida beating"
This one is special to me because I had forgotten all about giving this customer her new puppy care package. It's obvious she didn't! "I've met Mark a few times. I first ran into him first online, on Meet The Phlockers and now my husband and I will try to stop in and see him everytime we are coming through Flager. When I adopted my dog he made me a large goodie bag for him and some of the toys are still my dog's favorites. He is a good soul and anyone who knows him as a friend or as a bartender is blessed." All of the comments warmed me up on the inside and made the "not so fun" days, the "sweating all over myself and others" days, the "three deep at the bar and server tickets flowing onto the floor" days, and the "staying late to scrub the bar floor" days worth it. Plus, my friends at the Wickline Center (where I call bingo) couldn't wait to stick their copy on the bulletin board! I've said it once and I will say it again. Without great customers I would just be a guy pouring drinks and talking to myself. Got Tiki? The Daytona News Journal Does This Morning! TikiTender featured as "Local Character" in today's Daytona News Journal. FLAGLER BEACH -- Thirteen years ago, Mark Woods came to visit and never left. On a mental break from life as a counselor at a Missouri juvenile detention center, Woods landed at his parents' pad to figure things out. And that's when the beach called. "That was kind of a crossroads," said Woods, 37, now a bartender at the Golden Lion Cafe on State Road A1A. Woods -- also called "Tikitender" from his tiki hut-serving days at a local resort -- is known for wearing kilts ("They're very comfy; I recommend every man tries one.") and for his red goatee and easygoing grin. Thanks to Kari Cobham for making me sound so interesting! Please click below to read the article and leave some feedback for the author. Wouldn't it be fun if it became the most popular article of the day!? I wouldn't call it pride, but I am very happy to love what I do! Thanks to Tony & Carolyn for the great venue and to all my customers & co-workers who make my job a pleasure. I have never really used the Blackberry Messenger application much. In fact I haven't even had it installed on Switzer for a while. I am still a yahoo messenger baby, I guess. Plus everyone I know I email or text, which isn't a big deal because I am on the ultra-pricey unlimited packages for texting and data. Anyhow, I installed the all new version of BBM this morning and it seems promising. So if you want to add me my pin is 24A8543F. Last week I posted a quick list of basic vodka drinks and received a nice response. To show again how to take a basic drink and build on it, here is a baker's dozen of rum drinks. Unless indicated, the rums used are silver, light, or white rums (think Bacardi). We will start with the most famous of all rum drinks, the Cuba Libre, (not to be mistaken for a "Rum & Coke") and a couple others that are basically two ingredients. Pour rum & lime juice over ice in a highball glass. Top with cola. In a large glass filled with ice, combine all ingredients and shake gently. Build over ice in a highball glass, balancing with pineapple juice. Pour the first three ingredients over ice and stir well. Drizzle grenadine on top. Pour all ingredients except grenadine into a large glass filled with ice. Shake well and top with grenadine. Combine all ingredients in a shaker half filled with ice. Shake or stir to chill . Strain into a chilled cocktail glass. Garnish with a lime. If you like, you can rim the glass with sugar. In a large glass, crush the cherry and lime wedge with a muddler. Fill with ice and add remaining ingredients. There you have it. A bottle of rum, some fruit, some sugar, some juice and a few cordials. You're ready for a rum party now! Shake all ingredients and pour over ice in a Collins glass. *you can substitute generic triple sec for the Cointreau® in this drink. I don't recommend Grand Marnier® or Gran Gala®, simply because their distinctive flavors overpower the other ingredients. 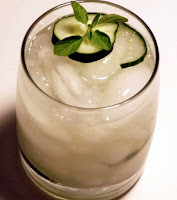 I have always been a fan of the Caipiroska, a Caipirinha with vodka rather than cachaca. Made with vodka, fresh lime, and sugar, a Caipiroska is a sweeter version of a vodka gimlet. It is very suited to a warm summer day. I found this idea over at Thinking Of Drinking, a Chicago based cocktail blog. I will be stopping by the Flagler Farmer's Market on Friday morning, so ask me for one this weekend! Shake with ice and pour all into a large rocks glass. Enjoy! Grabbing some pizza from Giuseppe's. Be jealous! I love my Monday night customers! Pour ingredients over ice in a highball or Collins glass. Stir gently and serve. Enjoy! Can't argue with her list, except Sara Smile seems a little out of place. Must have special meaning to her. Of course, I have a special Sara too. Wow I Need A Secretary Today! Club 927 is a special part of the Beach 92.7, showcasing local and regional musicians. With a very enjoyable format, plus great music, it is a can't miss! Club 927 airs live on Sunday nights, with internet archives available anytime. Dial up 92.7 on your FM dial if you are between St. Augustine & Daytona Beach. For the rest of you, click to www.beach927.com.